The very first version of the bot was written in about 1993, running on an obsolete 8 bit BBC Microcomputer. It was written in BBC BASIC. This was a standalone program so it could only talk to the person sitting at the computer running the program, or optionally, converse with itself. It was very simple, looking for specific words and phrases which were "hard coded" into the program, so much of the time it just returned a generic "I don't understand" type of response. The next version, written around 1995 for x86 DOS PCs, was able to read and reply to messages on Fidonet, which is a network of Bulletin Board Systems (BBSs) that exchange public and private electronic mail. Fidonet was at its peak in the 1980s and 1990s, before the internet became more common. This was the first time that the bot was able to communicate with a wide audience. This version also used a very simple set of words and phrases which evoked specific replies, but rather than sending back just one line it was able to recognise and respond to each sentence separately. It was written in Microsoft QuickBASIC, then a couple of years later was rewritten in Moonrock as a standalone version. This later version was also able to talk to itself. 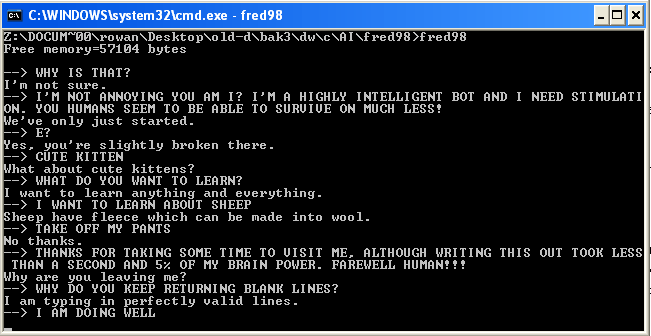 Fred1 and Fred2 (identical personalities of the same program) conversing with each other in 1997. The next version from around 1998 moved to a more "fuzzy" method which chose replies based on a scoring system that matched words in the input and reply database, rather than just looking for specific patterns and providing canned replies. This was the first version that "learned," by storing human input to use as a reply in the future, and is the basis for the current (as of 2018) version of the bot. It was coded in Moonrock. The program was standalone but was written with a view to being networked at some point. An example of the level of "intelligence" from the 1998 version of the bot. In mid 2000 the bot was recoded into yet another programming language and version, this time using a horrible mix of custom C, unix 'sh', and PHP scripts. It was web based, so the bot was now truly global, able to converse in real time with visitors from all over the world. At the time the bot had only two personalities: general, and uncensored. The latter was a mix of everything that had ever been typed into the bot, so it was fairly offensive, and often nonsensical, since the responses addressed both genders, regardless of what the visitor said. One unusual quirk of reusing every line without filtering or comprehension was that the bot could match and respond to inputs in languages besides English. It occasionally broke into French or German even when conversing in English, because it had been spoken to in those languages previously. The web domain sensationbot.com was registered in late 2000 and the bot has resided there since. Current development of the bot is focused on learning the context of a user's inputs and the bot's potential responses via Linear Genetic Programming. LGP is an artificial intelligence technology that broadly simulates biological evolution processes in order to create a program. Because the evolved program is computer generated and based on loose associations rather than specific and rigid rules, it is near impossible for a human to understand. It is effectively a black box that is trained to output a specific value or set of values when presented with a specific input, but when presented with a slightly different input will often still correctly interpret or categorise it. This means that a phrase or sentence which is expressed slightly differently, or even using a new word, may still be understood and responded to appropriately. This is a radical departure from the fairly simple "match input / generate similar reply / update state" methods in use since 1998, and is significantly more complex. Development is ongoing. Part of a C program generated by a computer using genetic algorithms.